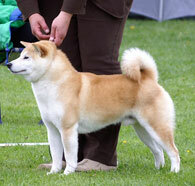 I remember Shibas from the first years I spent at dog shows in the early 80's. They were really special and caught my attention. 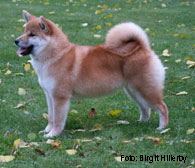 When I much later started to think about adding a breed to my kennel that do not require as much grooming as the Kerry Blues does, I recalled the Shiba. 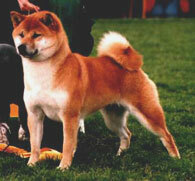 My first shiba came to me summer 2003. I had made some research and found out that kennel Explorer's had some very lovely dogs. I called the breeder and asked for a visit. Birgit Hillerby showed me her dogs and they were all very nice. Finally she showed me her older female "Foxy" and my heart almost stopped. This was what I was looking for. Unfortunately, Birgit told med that she was retired from breeding, 6 years old and after four litters. Well, not much to do about that. Maybe I could look forward to a granddaughter to Foxy instead. Next day I got a mail from Birgit saying that she changed her mind and would breed Foxy a last time. The sire would be her new male from Japan that was on his way to Sweden. Foxy got only one female in her litter and Birgit wanted to keep her for herself but she offered me to have her on co-ownership. So, Explorer's Lurime "Lori", came to live with me. Lori is a very special Shiba. I don´t know if it is because she has been raised among my Kerry Blues that she has a lot of terrier behaviour. She doesn't know what being reserved against strangers means. She just loves them. She loves everyone intensely. She has a lot of self-confidence and is well aware about her charm and good looks. She is the boss over my kerries but is the sweetest you can think around other Shibas. Lori is now retired after four litters. Nikki has now six puppies! 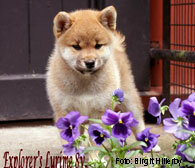 Sire is Explorer's V-Shouri.